MedsCheck is a program that allows you to schedule a 20 to 30 minute appointment with your Sinclair Pharmacist to ensure that you are using your medication safely and effectively. It is a free annual service that was created specifically for people who are regularly taking three or more medications at a time. The MedsCeck appointment is your chance to review your prescription, over-the-counter and alternative medications and discuss how they may be affecting each other. It is an opportunity to help you better understand and get the most out of the medication you take. Help you understand how to best use and store your medicines. A MedsCheck review at home is intended for those patients taking a minimum of three chronic prescription medications who are not able to come into our pharmacy because of their physical and/or mental health condition. A Sinclair Pharmacist will visit the patient at home for the one-on-one consultation and conducts an assessment summary that includes a medicine cabinet clean-up during the visit and the ability to remove unused medication for proper disposal at the pharmacy. MedsCheck for Diabetes is for anyone who is diagnosed with type 1 or type 2 diabetes. In some situations, a patient with diabetes may be taking only one medication or may be managing their diabetes without prescription medications. It is an opportunity for patients to meet with a Sinclair Pharmacist for a focused medication review including advice, diabetic training on devices, monitoring and diabetes education. 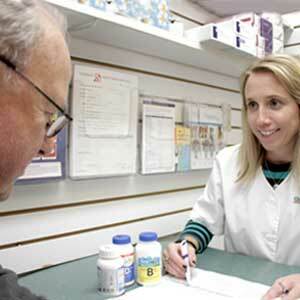 Have a chat with your Sinclair Pharmacist today to find out if you are eligible for a free MedsCheck review! All you need is your OHIP card. Contact us today. We are happy to help you reach your health targets and goals.